A goodly group of people experienced the delights of the Record Office at the Lancashire Archives. During a guided tour we delved into the past and saw many unexpected and interesting artefacts. Records are kept in a secure, temperature controlled environment. Some collections are held here on a small deposit and are therefore not owned by the archives. A great many records are ecclesiastical in nature for example parish records, diocesan collections, tithe maps. Probate records number around 300 thousand, in addition wills and inventories are held. Poor Law records, apprenticeships and custody orders and also settlement and removal orders for Poor Law applicants. The story of the ‘Wanderings of Martha Proctor’, an eight year old orphan tugs at the heart strings. She ‘tarried’ at Preston and was sent to walk round several towns in an attempt to find out who would take her in. After travelling alone she seems to have eventually arrived in Ormskirk. We could say that they at least they had the common decency to give her stout clogs for her journey. Of course only a cynic would say the clogs would help to remove her from being a charge on the Parish! Public Records are many, hospitals, asylums , police records, Quarter Sessions, electoral registers, highways and byways. Criminal, Assize and Higher Court records reside here also. Official records of turnpike roads, schools, building plans and would you believe the records of Morecambe Beauty Competitions. That by 1975 the archives were in possession of records going back for 900 years? That the original of Thomas Potts, ‘The Wonderful Discovery of Witches in the County of Lancaster’ is in their possession and all books on witches in Lancashire flow from this book?. That you can put in a request to see anything in the collection? We saw a wonderful gem – a 1450 Book of Hours, gorgeously illustrated. We were also able to touch one of the Rolls of the Honour of Clitheroe. That inquests were seen as a social event? 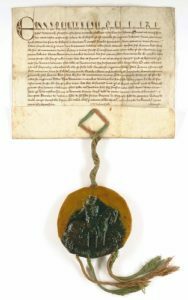 That Indentures for example for apprenticeships were indented and therefore able to be paired up with the other half of the document. That after the Gunpowder Plot on the 4th of November, people in Lancashire amazingly received news of this in a letter on the 6th November ? That Lancashire had an international reach centuries ago, there are letters pertaining to the Opium Wars in China and India. 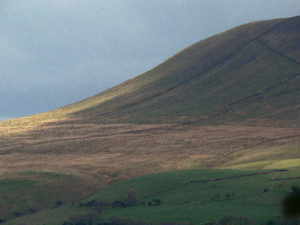 That there is a record of 1307 that mentions the “Mount of Pendle”? And finally, did you know that we saw the letter of Charlotte Bronte to the Shuttleworth’s of Gawthorpe Hall, Padiham, mentioning that “Old Pendle swells in every background”?. Now if that doesn’t’ make your heart swell, you probably weren’t born within sight of this majestic hill. We heartily recommend you to use your armchair and browse on line through their records and it is well worth a personal visit. Banner Image: Gunpowder Plot Conspirators by Crispin van de Passe the Elder. Public Domain.